Modern technology allows you to take your education out of a physical classroom and into the world, using online learning platforms. There are many different e-learning platforms to choose from. 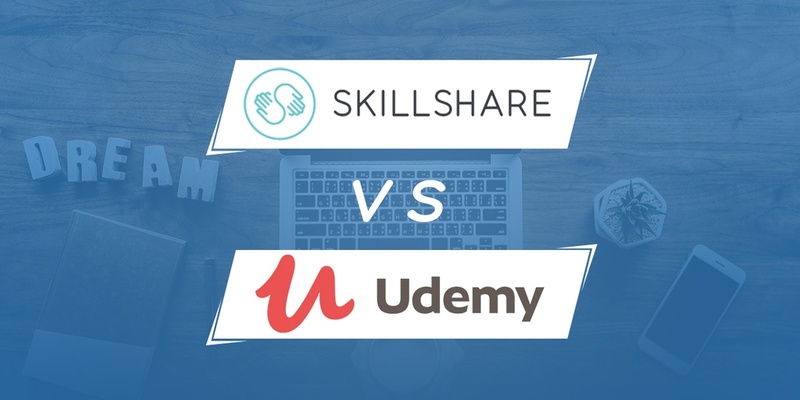 Today I’m going to take a closer look at two of them – Udemy and Skillshare. I’ll tell you how they both work, how much they cost, and their pros and cons. This will help you decide whether either of these platforms suits your needs. Overall, Udemy offers a wider range of courses than Skillshare. Once you subscribe to Skillshare, you get unlimited access to the platform’s library. You can also access classes while offline. Skillshare makes use of projects and videos as the key tools for learning. Skillshare does not give you a certificate, but you can post your project as evidence that you completed a course. When you sign up to Udemy, you get access to the courses that you pay for. It uses a wide variety of learning tools which include but are not limited to videos, audio, presentations on PowerPoint and more. Once you’ve finished your course, you will receive a certificate of completion. Skillshare accepts classes in a wide variety of languages but at present its community is predominantly English-speaking. Udemy runs on a pay-per-course business structure while Skillshare makes use of a membership business model. The pricing structure is a significant point of difference between the two platforms. Skillshare charges its fees on a monthly or yearly basis, and your subscription will give you unlimited access to all the platform’s courses. This is a good system for learners who love to learn online on a more frequent basis. It also means you do not have to worry about whether it is worth it to pay for a course or not. All you have to do is watch it, and if it's not right for you, you move on. Skillshare offers its membership at $15 dollars for a monthly subscription while its yearly plan costs $99 ($8.25 per month). For Udemy, however, you make individual payments on any course you wish to take. Buying a course guarantees you unlimited access to that course. This system is good for learners who wish to buy courses from different sources and build a collection. Courses on Udemy range from $10 to $200. Keep your eye open for the sales which Udemy regularly holds. In terms of course length, Udemy seems to favour courses that are longer and more in-depth. Courses on Udemy have a minimum length of about 30 minutes – most are several hours’ long. Skillshare’s courses are generally shorter. While there is no restriction on how long courses can be on Skillshare, you will find that many of its courses could be just 10 minutes long. Udemy courses tend to take an in-depth approach to any topic, giving you the opportunity to develop your mastery. However, an advantage of Skillshare’s shorter courses is that is is easier to incorporate your learning into your everyday schedule since classes do not consume a lot of time. The feeling of being able to take a course quickly and still getting great knowledge out of it can be a motivation to learn. For a very creative person looking to acquire newer and more relevant skills or looking to improve on already existing skills, Skillshare would be a great place to learn. If you also enjoy carrying out projects in order to apply the knowledge you have acquired, then you will also find Skillshare useful. Some learners love to explore a wide range of options before they decide on which course to take for a particular topic. And others may not need to take many courses within a short time frame – perhaps just the odd course here and there in areas they are interested in. For these kinds of learners, Udemy would be a perfect online learning platform. Skillshare and Udemy are both great online learning platforms. Both platforms will give you an adequate and affordable education on a wide range of topics. If you think you'll take a lot of courses, you may be better off going with Skillshare as the monthly membership will enable you to learn more for your money. However if it's just a one off subject you want to learn a bit more about, then Udemy may be the better option for you.